We just love compact and stylish solutions for carrying our items and we’re super glad to introduce you to such a product- Lotuff Black Leather Portfolio. 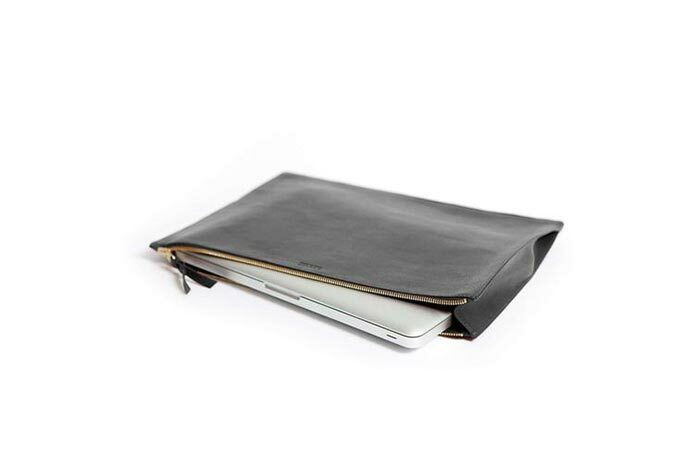 This cool looking pouch is crafted in New England out of tumbled, vegetable-tanned leather. This material together with a solid-brass YKK zipper makes it very durable and long lasting. As for the capacity, inside you can fit a tablet, all sorts of documents and even a 15″ laptop. The Lotuff Black Leather Portfolio can fit your tablet, laptop and documents. It’s made from vegetable-tanned leather. The Lotuff portfolio measures 11 x 15 x 1 inches. Thanks to these dimensions, you can easily pack it into any briefcase, backpack or duffle. Of course, as it looks minimalistic and stylish, you can carry it on its own. Get it from Todd Snyder here.